Before there were Xboxes and smartphones, TVs and radios, and even theater and literature, people sought entertainment in other ways. Among those activities was the experience of star gazing. The endeavor was a social one, often involving conversation and the creation of folklore around oddly shaped objects that observers conjured up in the stars above. Though the same stars hang above us today, those interpretive experiences are few and far between. But a group of graduate students from the University of Texas at Dallas are working to change that. Their interactive activity, the Constellation Game, brings back the experience of campfire conversation and celestial storytelling. 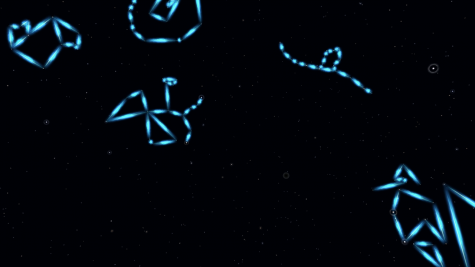 Visitors, or “players” of the game, are encouraged to let their imaginations run wild as they use a motion controller to “draw” their own constellations in a projected night sky. They can even invent their own myths around their creations. This Friday, we’re excited to have the Constellation Game set up on our Ross Avenue Plaza for our monthly Late Night. In preparation for Friday night’s activities, we took the opportunity to ask Spencer Evans, the lead programmer behind the experience, a few questions about the Constellation Game. 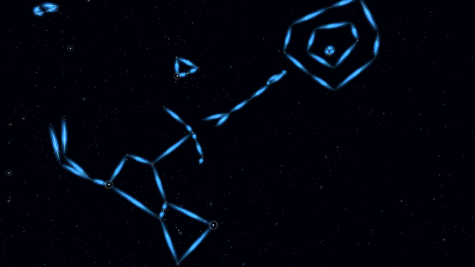 How did you come up with the idea for the Constellation Game? SE: In many ways, the idea we initially came up with is actually far off from what we have now. It was a very vague idea that evolved organically, and was refined based on players’ impressions and our realized goals. We are big fans of games that fit in the play space between arcade, art gallery, and museum exhibition pieces, and we wanted to create something in that same space. We are also very passionate about storytelling and mythology, and we wanted to revive that act of storytelling around shapes perceived in the stars, which seems a bit lost and forgotten today. To that end, it was also important to us to create an accessible interface and interaction that people today can understand. SE: The core player experience is to create and draw constellations in an almost connect-the-dots like way in a shared space. 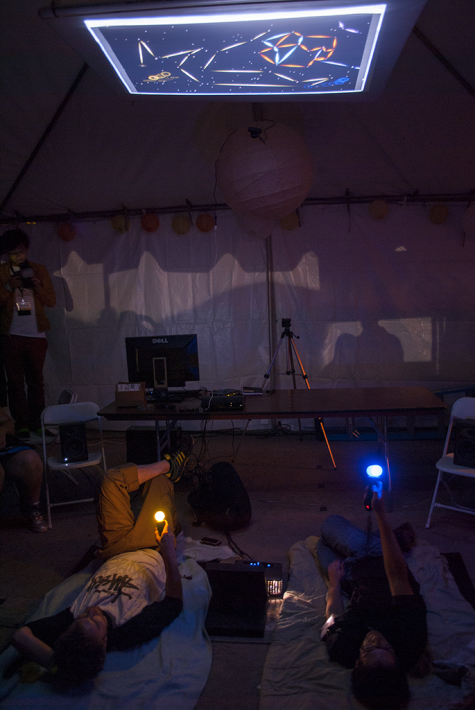 Players do this with a motion controller while lying down, looking up at the stars of our night sky projected onto the ceiling, and discussing with others the meaning of the shapes created. Our design was focused on storytelling, social interaction, and creative expression. And, we strove to create an experience that closely resembles the relatable, perhaps nostalgic, real-world act of lying down outside and pointing up at the stars. We feel this is something that comes through in the way players interact with it, and the immersive atmosphere we try to create. What have you learned by watching visitors interact with the installation? SE: We have learned that it is very much a group experience, not just the one or two players currently interacting with it. It is the audience participating as well. Everyone tends to explain or argue about the shapes they are seeing, and share their personal interpretations that they, and others, have made. We have learned that players tend to enjoy exploring the star-field—the space in which they can draw constellations—before they create their own. They want to see what others have created first, and see which star clusters or historical constellations they recognize. If you want to make your own constellations, you can play the Constellation Game between 8:00 and 11:00 p.m. this Friday. We’ll also have numerous other activities, performances, tours, lectures, and more! Find the full schedule here. Betsy Glickman is Manager of Adult Programming at the DMA.